namaste - a welcome greeting & a symbol of hospitality! The Taittirriya Upanishad (source) says "Athithi Devo Bhavah" which reads "May your guest be your God" laying down the guiding principle for Indian hospitality. The offering of the doctrinal "chai-pani" (tea -water) as you enter an Indian home is not just a social more but an ingrained symbol of hospitality. Images of my grandmother's considerate hospitality extended to her guests is lovingly etched in my memory. She never turned away a guest unfed and her piquant home cooked meals came to be a symbol of her legendary hospitality in our circles. Our dining room gets ready for visitors! I have always sired a passion for hosting even since the time I was a novice cook (pity my first guests!) Entertaining implied inviting friends into our house and into our lives. Over the years, our home has hosted many gatherings - poker nights, festive potluck dinners, sunday brunches, casual chai huddles and celebratory regales. And so, for me, entertaining has evolved into an esoteric interest. Being on this side of the pond, I have the opportunity to combine the Indian tradition of hospitality with the Western art of entertaining. From theme parties to cocktail hours to fine dining, the Western way of entertaining involves the creation of a viscerally stimulating experience - one that I have come to admire and appreciate. An assortment of colorful Indian delicacies served in basic white serveware. Hosting a party means putting several elements together - the food, the beverages, the table scape, the music, and the people. While it sounds simple enough, cohesively bringing the said elements together involves scrupulous planning, effort and preparedness. Entertaining is not only about cooking a meal and feeding your guests - it is about creating a palpable experience with a harmonious medley of ingredients - the aroma of food and flowers, the ambience created by music and lights, interesting conversations and lots of laughter. And hence the reference to art. 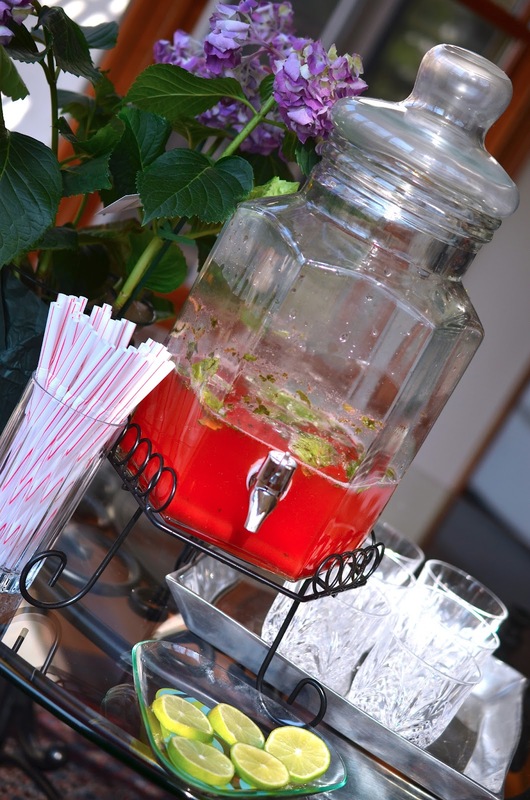 Throwing a good party takes time and if you are working outside the home it takes even more time! Given that my work days tend to be busy, I plan days in advance checking off one little thing at a time. Planning well and getting a head-start is a great way to trim costs. Prepping lets you do more at home and outsource less. A to-do list is your best friend and allows you to track all the little details. The chaos and frenzy leading up to the event can leave you worn out and frazzled. Therefore, I seek help when necessary. Cleaning your home, picking your serveware and tableware, cooking the dishes, setting the table, planning the decor - the tasks add up quickly! There are times when I wished I had my mother or my aunts around and that's when I turn to my girlfriends (thank god for them!). So, once you have the logistics down -it's time to party! We recently hosted our American friends at home. The challenge of showcasing India through the food, desserts, decor and customs to an international audience was something I thoroughly relished. Collating the spices, the aromas and the textures for a non-Indian palate was a formidable but fun culinary exercise. 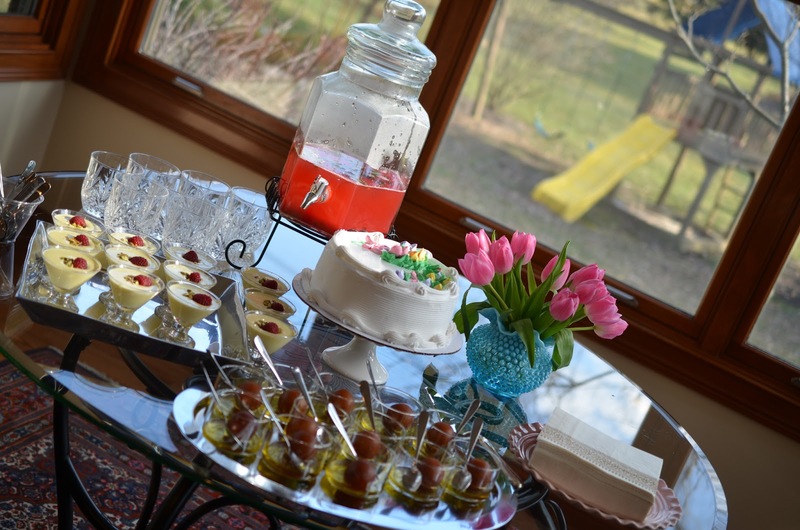 I used a base of solid white serveware to let the vivid colors of the food and decor pop. The food was served buffet style but prearranged seating around the table allowed for a more relaxed "sit-down" dinner. For the tablescape, I used white as the anchoring color with purple and fuchsia as accents. The dessert bar had a choice of two Indian desserts served in mini-flares and mini-bols for visual appeal. I also had a cake, just in case! Experience has taught me that contingency planning is key. I toyed with the idea of serving lassi but settled on a watermelon cooler punch keeping in mind the little guests of the day. The bright red beverage added just the right splash of color. I tied in all the different elements with one common denominator - the elephant. That's right! Nothing represents India with more sanctity than the mighty elephant. From Indra's Airavata to Lord Ganesha to Maharaja's sawari, elephants have gained notoriety as an Indian cultural symbol not to mention they are also a personal favorite! Yes, I collect elephants! The bright red hand painted wooden elephant flanked by arabismo Morroccan glass serving as candle holders (more on that in another post!) looked resplendent as the buffet centerpiece . And lastly, my hand drawn elephants on the menu and the namaste sign board added a personal touch to the party . My party was by no means perfect and it was never intended to be! But it was priceless, nonetheless - as a group of wonderful people gathered around my kitchen island to enjoy a home cooked meal and filled our home with warmth and laughter! At Aalayam, we like to shine the spotlight on treasures that are unique to our homeland and today, I will be drawing your attention to my table linen in a beautiful block print fabric. There is nothing more simple and sophisticated than block print fabrics. An ancient textile imprinting technique, block printing is done by artisans in rural India and these handmade fabrics are perfect inspite of their imperfections! The symmetry of the ornate motifs adds drama and detail and makes these fabrics a great home decor accessory and more recently a global design trend. In a provencal (?) and paisley pattern my place mats and napkins are cheery and compatible with the spring weather. Buy block print and keep this artistic textile making technique alive and infuse your home with color, texture and a chic sensibility! Check out Apartment therapy's feature on the Indian block print fabric. Be merry, live well and savor your Srikhand! Recipe for Srikhand from here! All images are from my home and copyrighted! Please ask before using. p.s: Thanks to turmericnspice for helping me plan the menu! Deepa, Beautiful post... loved every bit of it.. I am new wife:P and looking forward to hosting parties with my newly acquired freinds and family... while playing the part of a perfect bahu... this will be help...!!! Thanks so much. ..
Dear Shazi: Thank you and you are very welcome! Congratulations and best wishes for an exciting journey ahead! It took me a long time though to collect all the dinnerware until then I was always mixing elements and that works too! Just buy some fresh flowers - I always swear by them! Each picture here has a story to tell... Loved your post and I am sure will be visiting you more often ! I just loved your concept of Menu card and Hand drawn elephant, you are super duper talented!! Will try this Shrikhand recipe sometime..
disha: thanks for joining this site and your kind words! comments like yours inspire our work - so thank you ! ritu: thank you! indeed, a picture is worth a 1000 words and they tell the story better than we ever can! please do come back - supriya will showcase a lovely home in our next post. gayatri: yes, the menu is very helpful when you have an international guest list. you could even do individual labels. thanks for reading. don't know about talent, but I do dabble in creative things every now and then to maintain a work-life balance! the srikhand was sooper easy and sooper yummy! Muchas gracias Shalini! come back, supriya is showcasing a gorgeous home next! Deepa...lovely post..I thoroughly enjoyed all the writing...everything looks so perfect. I like all your choice. can I ask from where do you source the dining table? Nayana : Thank you for your kind words of appreciation. The table was a world market find! A little tip though - don't buy the table and chairs as a set, I paired the studded dining chairs with this table and I think it works? They have a lovely assortment of chairs to pick from - so don't be afraid to mix and match!